We want you to understand the charges on your electricity bill. The more you know about electricity rates, the easier it will be to make informed decisions about your energy usage or whether an electricity contract with an energy retailer is right for you. Your electricity utility delivers electricity to your home or business and issues your bill. The bill includes the costs for the electricity that you use, the services your local utility provides and some other costs as outlined below. 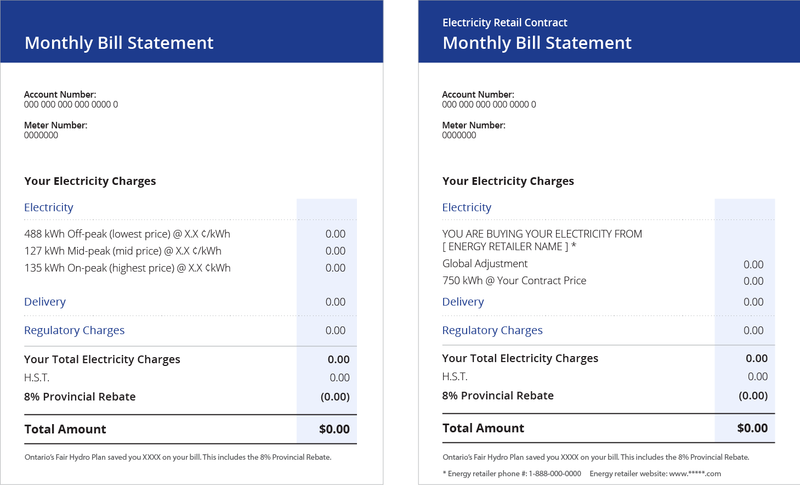 Below are two sample electricity bills. One is for households and small businesses on time-of-use rates. The other bill is for households that have signed an energy contract. Your bill includes a line item called Electricity. This is the cost of the electricity that you used during the billing period. Most Ontario residential and small business consumers that buy electricity from their utility are billed using time-of-use rates. Learn more about managing your costs with electricity time-of-use rates. Fewer than 1 in 10 customers are billed using tiered rates. These rates vary depending on how much electricity you use. The Ontario Energy Board currently sets these rates in accordance with the government’s Fair Hydro Plan Act, which came into effect on June 1, 2017. Learn more about this legislation. All electricity consumers have to pay a share of the Global Adjustment. The time-of-use and tiered electricity rates charged by your electricity utility already include an estimate of the Global Adjustment. If you sign up for a contract with an energy retailer, you have to pay your share of the Global Adjustment on top of the contract price. The Global Adjustment will also appear as a separate line on your bill (see above sample bills). Use our bill calculator to compare the electricity rate charged by your utility with the contract price offered by an energy retailer. The Ontario Energy Board sets delivery rates for electricity utilities in the province. Some of the delivery charges are "fixed," meaning the same amount no matter how much electricity you use in each month. Other charges vary depending on how much electricity you use. Starting January 1, 2017, the Ontario government is providing an 8% rebate on your electricity costs, equal to the provincial portion of the HST. For more information visit the Ontario government website. Use our bill calculator to estimate your monthly electricity bill. You can also compare your current bill with a contract offer from an energy retailer.